It is time to start this thread. Up to a few weeks ago I was building (I am always building, they are never finished) an On30 layout named the Henderson Bay Railway and Navigation Company. That project has been terminated and I have started on an HO layout that will be the Henderson Bay Branch of the Burlington Northern. The "Henderson" sticks because it honors my long time friend and dedicated railroad historian, John Henderson. 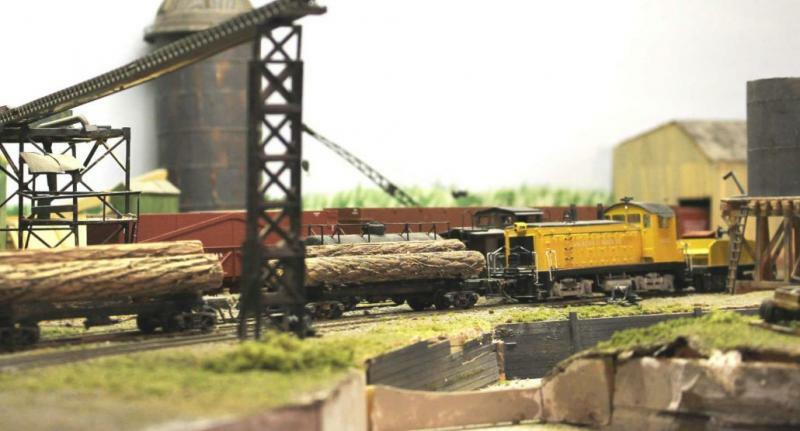 Some of you may be familiar with his work related to logging and industrial railroads. He is most noted as a major contributor to the defunct magazine "Tall Timber, Short Lines". His obituary was in the last issue of that magazine. Probably not a coincidence. He also contributed to other publications, primarily "The Narrow Gauge and Shortline Gazette", as well as having by-lines and photo credits in many books and publications related to industrial, logging and short line railroading in the Pacific Northwest. 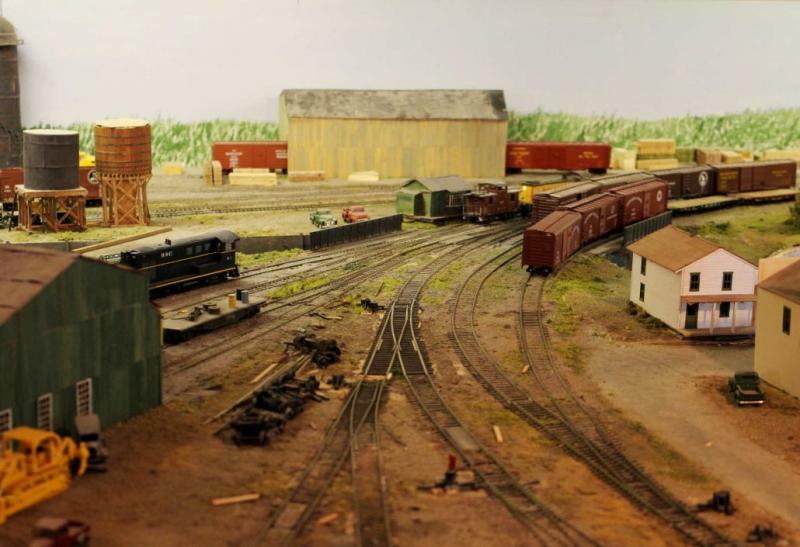 The new layout will be a fictitious branch line similar to the Northern Pacific's branch to Raymond, Washington on Willapa Bay. That line was one of John's favorite short lines. The right of way is now a bike/hiking trail. The era will be right at the beginning of the merger of the GN, NP, SP&S and CB&Q. So I can run equipment from all those railroads plus the BN. I am using the benchwork from the HBR&TCo. The layout will be point-to-point. The trackplan will be, essentially, two of the "Thomasville" modules joined by a mainline run. The "Thomasville" module is based on the old John Allen "Time Saver" and is at the center of the book "Your Next Model Railroad". I have been wanting to build that trackplan for a long time. Equipment will be mostly ready-to-run and structures will be Walthers Cornerstone and similar plastic kits. Contrary to my normal practice (all handlaid) track will be commercial turnouts and flex track. The object is to be able to include my grandkids in the construction and operation. Train controls will be DCC and turnouts will be hand thrown using over-center springs. Simplicity is an important element of this layout. Sounds great! I remember John Henderson, a great author and logging historian. A nice tribute indeed. As for a logger, there are many old, steam powered logging lines being built these days, most are narrow gauge. And while I dearly love narrow gauge and logging (even though I build mining lines), I have seen few "modern" loggers in standard gauge. You could have GP's and the like and maybe an old teakettle near the enginehouse. Flex track & switches? Sounds fine by me. Easy to build kit structures-something the kids could really get into. One of my best friends forsook (?) 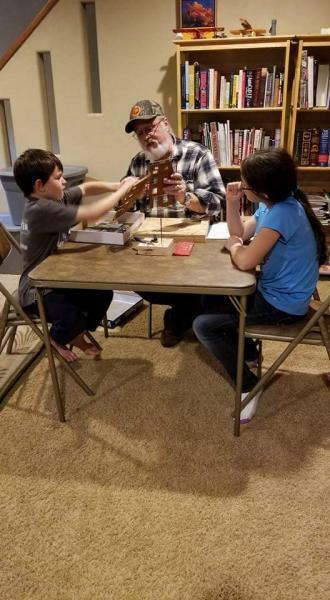 modeling a 2 footer mining line to build a modern layout with flex and kits and his grandkids love it (as does he). Have fun and when the main is down, you & the kids run the wheels off. There's the fun of this hobby! I have a friend in Hertford England modeling Simpson. I think he is modeling modern era with the SW type locomotives. It occurs to me I have never seen photos. I need to buck him up. John was a very close friend who saw me through some very tough times, as well as some really great ones. He was the best man at my wedding. We were often mistaken for brothers, and pretty much functioned that way. Lots of great railfan trips together. I miss him a great deal. Here are some photos from my friend, Alan Sewell, in Hertford, England. His is a "fantasy" logging line based on modern Simpson and Weyerhauser practices and equipment. He was a close friend of John Henderson's, as well. I have tried to talk Alan into joining Freerails. So far no luck. 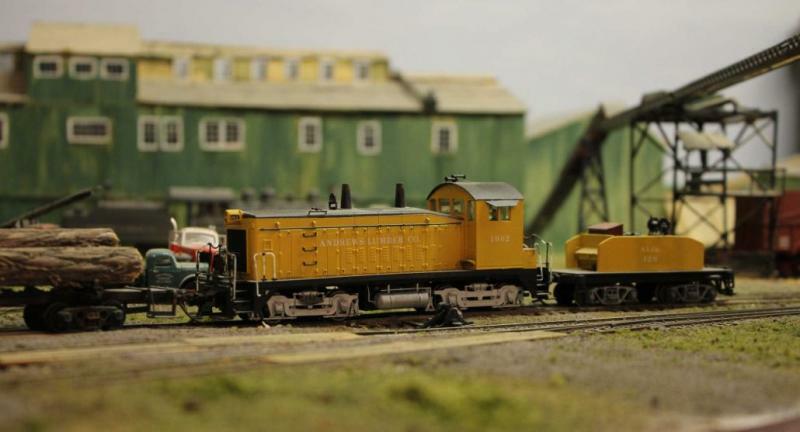 "Edited"...he has joined and contributed a great beginning article on his layout. Chrome doesn't play well with the Gallery. In times past I couldn't upload photos to the Gallery in Chrome. At least I can do that now. But I can't access the Gallery while composing a "Reply" while in Chrome. I could probably do it in Firefox, except the Linux version of Firefox has a tendency to lock up my computer. Nice HO logging pix. from your Brit. buddy ! 1 'attachment' per Post is normal operation for that feature. This method overcomes problems caused by a Microsoft 'Windows-10' update. I believe it may work with other 2nd rate products like 'Chrome' as well. Jose reports that for Linux, he uses the 'Opera' browser & everything ROCKS with that software on Linux ! Well, the first building for the Henderson Bay Branch has been completed. We (the grandkids and I) are building the structures first so that we can arrange them the way we like and plan the track around them. Definitely the first time I have built a layout this way. I have been in the hobby for more decades than I care to count. This is the first plastic structure I have ever built. It is a Walthers Cornerstone kit. Having built plastic models of other things (cars, boats, rolling stock, airplanes) I can say that this kit is very good quality. 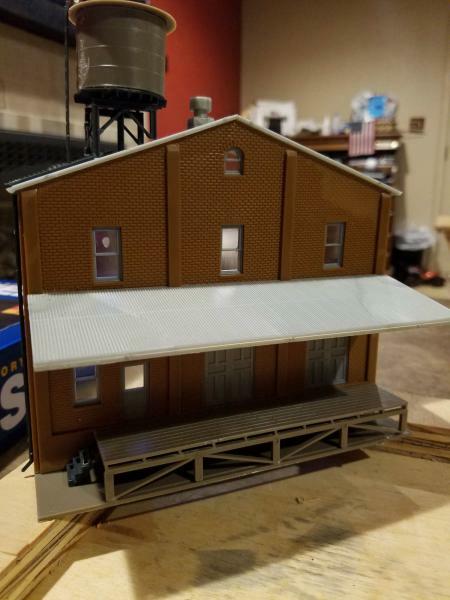 With a bit of paint and some weathering, plus a few additional details, this could be a model as good as any craftsman kit. This structure is built right out of the box. For the first time in my many years of model railroading, reaching a certain level of layout completion is a primary goal. The only difficulty I had in assembly had to do with the brick colored parts. The acetone (which I have used for many decades in building styrene models from scratch) did not bond the brick colored parts. It worked fine on everything else. So I picked up a quart of MEK. That worked. One other objective of using the plastic kits is the minimal need for tools. We (I) can work on the card table in the family room instead of being sequestered in the basement or the shop. Now we need to start on the next structure. There will be a total of five, at least to start, at the west end of the layout. I haven't assigned town names yet. I have made a change in the concept from the On30. That plan included the entire railroad. 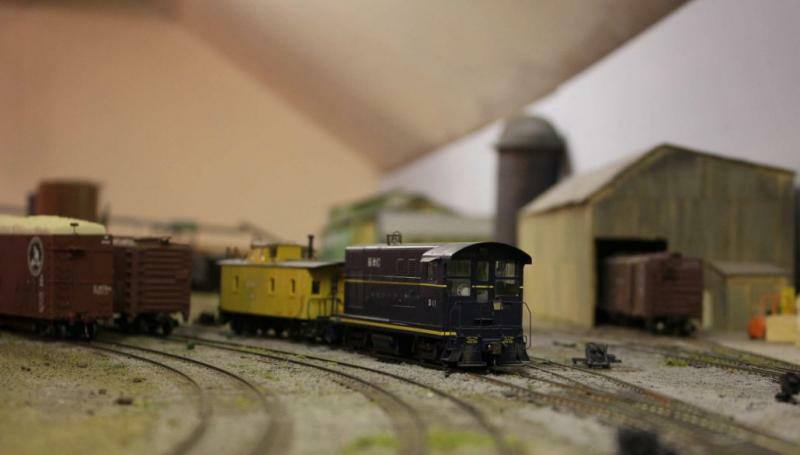 The small narrow gauge shortline could be justified by the traffic generated by the industries on the layout. The HO version will need justification for longer trains. So the west end of the layout will not be the west end of the railroad (Henderson). There will be a kind of interchange track at the west terminus of the layout to park rolling stock destined to go further west to Henderson. That operational concept is similar to Puget Sound & Pacific operations where Elma serves somewhat like a division point. Trains come from the interchange with the BN at Chehalis and go to Elma, where they can either go west to Aberdeen, or northeast to Shelton, Bremerton and Bangor. Adopting this operational model justifies more traffic than can be accounted for by the industries actually modeled on the layout. So I need three place names in addition to Henderson. I want to use names from the original NP Raymond branch. They give a sense of place, plus there are colorful names from which to choose: Pe Ell, LeBam, Mox, Malone, as well as some less colorful: Oakville, Rochester.